Home Business Segments Corporates Ambani scion Akash to be betrothed to diamantaire’s daughter Shloka? Ambani scion Akash to be betrothed to diamantaire’s daughter Shloka? Mumbai, March 4 : Wedding bells may soon be ringing in the country’s premier business family. 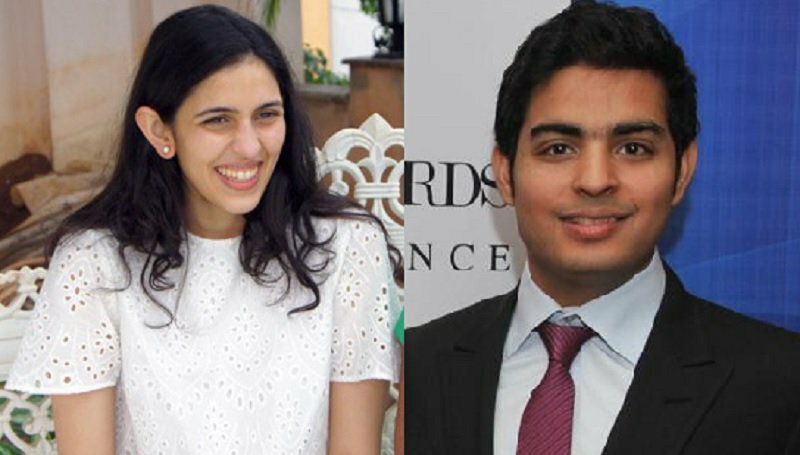 According to reliable sources, Mukesh Ambani’s eldest son Akash may soon be betrothed to Shloka, the youngest daughter of Russell Mehta, Managing Director, Rosy Blue India, one of the country’s leading diamond companies. Though both families are keeping the news under wraps for the present, sources in the know indicate a formal engagement ceremony soon, with the probability of a wedding come December. Akash, 27, is Mukesh Ambani’s elder son and twin of sister Isha, and older brother of Anant, 22. Shloka is the daughter of Russell Mehta, head of Rosy Blue Diamonds, formerly known as B. Arunkumar & Co., which is now ranked among the top half dozen diamond companies of India. The family lives in south Mumbai. Russel is the son of Arunkumar Ramniklal M., one of the co-founders of B. Arunkumar & Co., way back in 1960 in Opera House, Mumbai’s hub of diamond business. The duo is described as among “the most respected diamond business families of India and around the world” by a close family friend. “Shloka is a very charming girl, extremely cultured and its difficult to say which of the two families is lucky with this upcoming marriage,” said the family friend, requesting anonymity. Many in close business and family circles have already been unofficially “congratulating” them, but they have been waving them off and asking them “to wait for everything to finalise before we give you a party”. Coincidentally, Akash and Shloka are alumni of the famed Dhirubhai Ambani International School (DAIS), in the Bandra Kurla Complex here. After schooling at DAIS, Akash studied at Brown University, a private Ivy League institution based in Rhode Island, and among the most prestigious in the US. On her part, post-schooling at DAIS in 2009, Shloka left for the US to study anthropology at Princeton University and later completed her Masters in Law from the London School of Economics and Political Science. While Akash is on the board of Reliance Jio, Shloka is a Director with Rosy Blue Foundation and is a co-founder of ConnectFor, an organisation that helps NGOs get volunteers for various causes. When contacted, sources from both families declined to comment on the upcoming engagement ceremony or the subsequent wedding, the dates or the venue. Shloka is the youngest of three siblings of Russell Mehta and Mona, who is a close relative of the controversial diamantaire Nirav Modi.